In this month's episode I challenged myself to create TWO MEALS for a family of four for $20. I got some online feedback that said "it really isn't a challenge to do one meal for $20..." and even though you and I know it is, I had to push my limits and go for the gold. Go back to see the first recipe for CHICKEN and RICE SOUP. 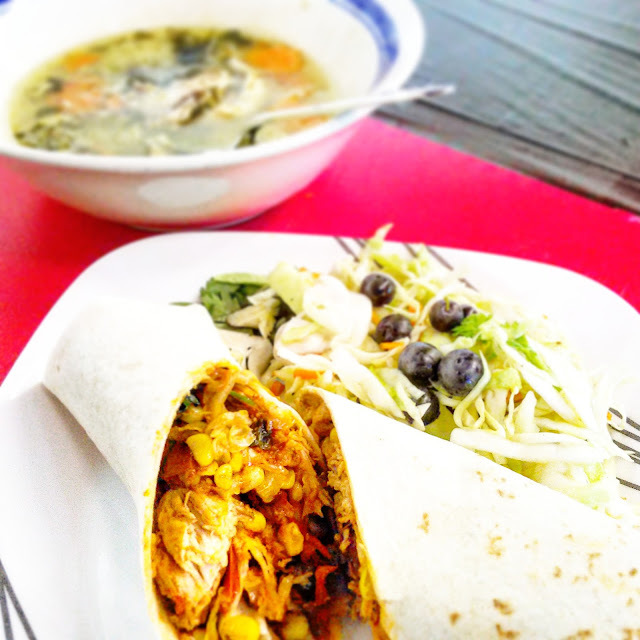 Today I'm posting the second dish, chicken burritos: chock-full of vegetables, seasonings and farm-fresh, antibiotic free chicken. The blueberry coleslaw recipe isn't new to this blog and you can find that recipe HERE. But this is the first time I've ever done burritos on the blog! At home, I joke that I eat like a teenaged boy: pizza, chicken nuggets, tacos, burritos, Doritos and that's pretty much it. It's a rarity that I eat "fancy" food when I'm at home alone, when no one is watching. Occasionally, I'll get a wild hair and whip out my culinary skills for myself. But at home, it's KISS: Keep It Simple, Stupid. Hopefully, I've been able to inspire you to visit the Dixie Classic Fair Farmers Market. I sincerely hope you create these dishes or are able to create your own dishes using farmers market ingredients. Add cheese, rice, beans and anything else you can find at the market to make these your own. Heat the oil olive in a medium skillet over medium-high heat. Add corn kernels, tomatoes, cabbage and chicken; cook until the mixture starts to sizzle, about 2 minutes. Add the taco seasoning, then stir in the chicken and cook until the mixture is coated, about 2 minutes. Stir in the cilantro and season with salt. Heat the tortillas as the label directs. Arrange the mixture in the middle of each tortilla, leaving a 1 1/2-inch border on all sides. Fold the bottom edge of each tortilla snugly over the filling, tuck in the sides and roll up tightly. Cut the burritos in half and serve. The Dixie Classic Fair Farmers Market and the City of Winston-Salem is sponsoring the $20 Challenge twice a month through September 2015. I will stage a live cooking demonstration in which I will prepare a meal for a family of four for $20 using ingredients I buy at the market that day. Another delicious winner and so economical! I'm loving following along with your challenges! More proof that a delicious meal doesn't have to break the bank! 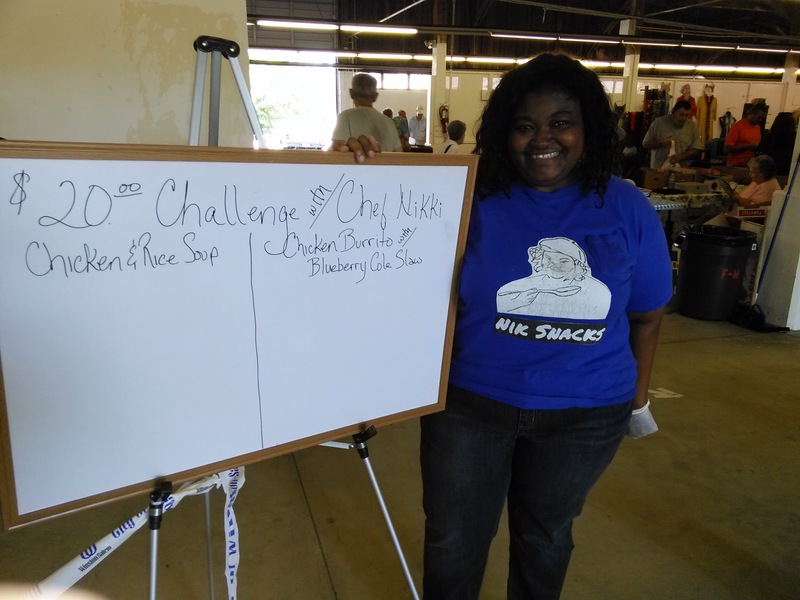 It isn't easy to get 2 meals with $20...you have to be creative and I think you nailed it with your recipes, Nikki!! I eat the same way! Pizza, chicken fingers, pasta, and hamburgers. Why mess with fancy food when you could have one of those other options? ;) You did so well with the challenge! Great that you could do two meals. Wow! Great job and your burrito looks delicious! So I have been thinking about this since the first post and I totally think it is doable. I make two meals all of the time for $20 for a family of 6!! Our weekly grocery bill is about $120, so in fact it can be done! Love me some burritos! Nicely done. Two great recipes for $20. I really love the looks of your burrito and your video is fun to watch! Great job! This chicken burrito looks amazing!!!! I'm with you, keep it simple at home. If I'm having someone over, I'll jazz things up a bit! Woah! That's a crazy challenge! Food is so expensive - especially good food! I'm absolutely amazed by your results - congratulations, mission accomplished!! 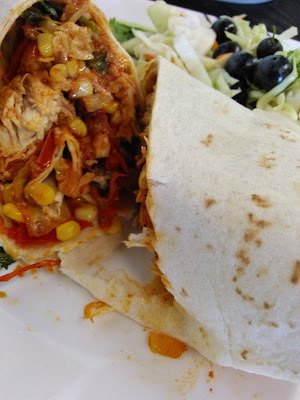 Burritos are always a hit in our house, and I love the sound of that blueberry slaw. Great $20 meal idea! This chicken burrito looks incredible! I want one now! I love the idea of this challenge!! That looks so good!